KEDkrafty: Jury Service Monster Sockage! Last week I was on Jury Service at the Sheriff Court in Glasgow. It was stressful, uncomfortable, pointless and generally a right pain in the bahoochie. However, I did manage to make some progress on my toe-up Monstersocks on the rare occasions that I got a seat, and have now finished both legs. All that remains now is for me to graft the heels and sew in the millions of ends. 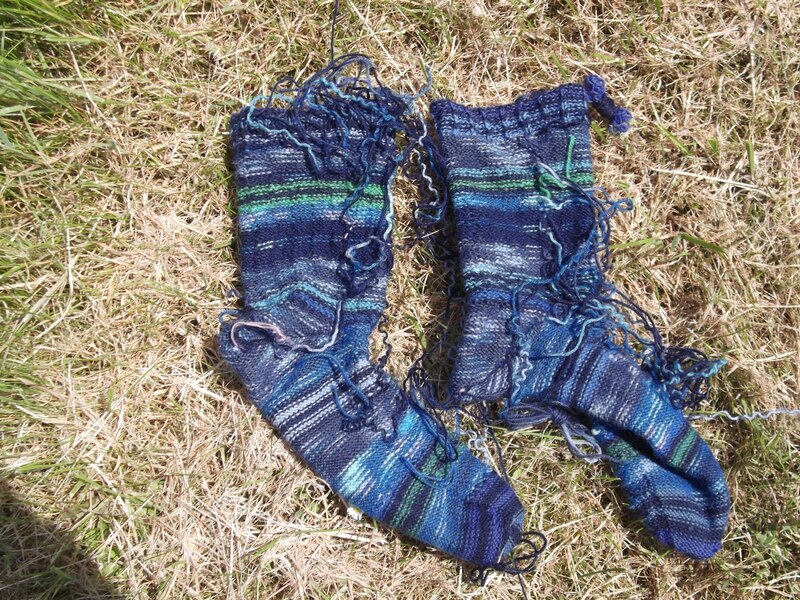 These Monstersocks are made from remnants of Regia yarns I've been left with over the years. I'll give more pattern details when they are totally finished, but for now I'll leave you with some pictures of them looking particularly monstrous, inside out and with all those ends to fasten off and with our grass looking like straw.